Netgear has added another router to its range of Nighthawk routers. The Nighthawk X4S, is the industry first DOCSIS 3.1 Gigabit Cable Modem Router and is also certified for Comcast Xfinity internet services. 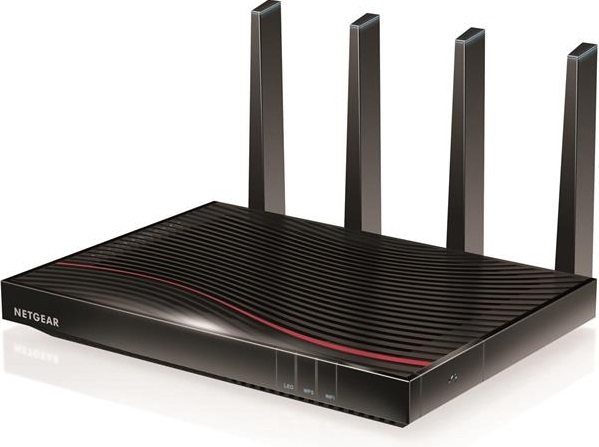 With support for the updated DOCSIS, The Nighthawk X4S AC3200 WiFi Cable Modem Router (C7800) is able to deliver Gigabit internet download speeds and strong and fast WiFi connectivity. This breakthrough technology makes it possible to get ultra-fast Gigabit internet speeds through the existing coaxial cable connection. The Nighthawk X4S AC3200 WiFi Cable Modem Router is required for the fastest internet speed tiers offered by Comcast XFINITY and other cable internet providers. The C7800 is backward-compatible with DOCSIS 3.0 and works for all speed tiers. With the purchase of a DOCSIS 3.1 cable modem router now, you can rest assured that it will work on your current cable connection and you are ready to enjoy higher internet speeds service it’s rolled out to your region. The Nighthawk X4S AC3200 WiFi Cable Modem Router offers the latest and fastest cable broadband speeds, and also provides all the benefits you expect from a full-featured dual-band wireless router. It delivers WiFi speeds up to 3.2Gbps for the devices connecting over WiFi on your home network, with a quad-stream architecture that dramatically increases WiFi range using active antenna technology ideal for mobile devices. The NETGEAR Nighthawk X4S AC3200 WiFi Cable Modem Router (C7800) is available now from major retailers in stores and online in the U.S. at about $399.99.